A genuine Swedish handmade orthopedic clog that is made in a small village for generations that pass the secrets of making clogs from one to another. The wooden sole consists of alder represent a basis for the orthopedic product, the uppers are punched from leather of the highest quality. The nubuck leather is velvety and soft and comes in brown or denim color. The heel height is 4 cm. 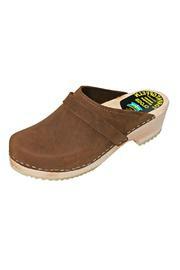 These clogs are great to work with them, walk with them and are great closet essential.